The Canadian Government sponsors this lottery for the promotion of the 2010 Soccer World cup to be hosted in South Africa.We happily announce to you the draw of the Euro-Afro-American Sweepstake Lottery International Programs held on wed 21 march 2007 in Essex United Kingdom and Ontario Canada. 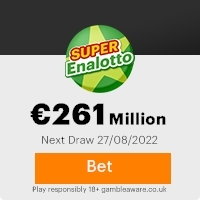 Your e-mail address attached to Ticket Number: B9564 75604545 100, with Serial Number 46563760 drew the winning numbers 3/ 7/ 26/ 30/ 33/ 46 with a bonus Number 32 , for LOTTO 6/49 under the choice of the lottery in the 2nd category of daily three. You have therefore been approved to claim a total sum of US$820,000.00 (Eight Hundred and Twenty Thousand United States Dollars) in cash credited to file EAAL/9080118308/05.This is from a total cash prize of US $11,100,000.00 Million dollars, shared amongst the first One Hundred and-thirty (130) lucky winners in this category Worldwide. This is part of our precautionary measure to avoid double claiming and unwarranted abuse of this program by unscrupulous elements. Please be warned! To file for your claim, please contact our corresponding Agent in South Africa immediately you read this message for quick and urgent release of your fund, contact information is as follow: MR ALLEN JAMES,email:claimsverifications@executivemail.co.za to avoid unnecessary delays and Complications, please quote your reference numbers and winning date in any correspondences with our designated agents. Congratulations! Once more from all members and staff of this program that has ensured that you won this competition. Thank you for being part of our Promotional Lottery program. Previous: Mrs.Soria Â MolinaFresh ScamsNext: Ms.Verbong Piret. This Email with the Subject "Ms. Gwen Shapiro" was received in one of Scamdex's honeypot email accounts on Wed, 11 Apr 2007 01:28:08 -0700 and has been classified as a Generic Scam Email. The sender shows as Gwen Shapiro <claimsnotifications1@yahoo.ca>, although that address was probably spoofed. We recommend that you do not attempt to contact any persons or organizations referenced in this email, as you may expose yourself to scammers and, at the very least, you will be added to their email address lists for spam purposes.